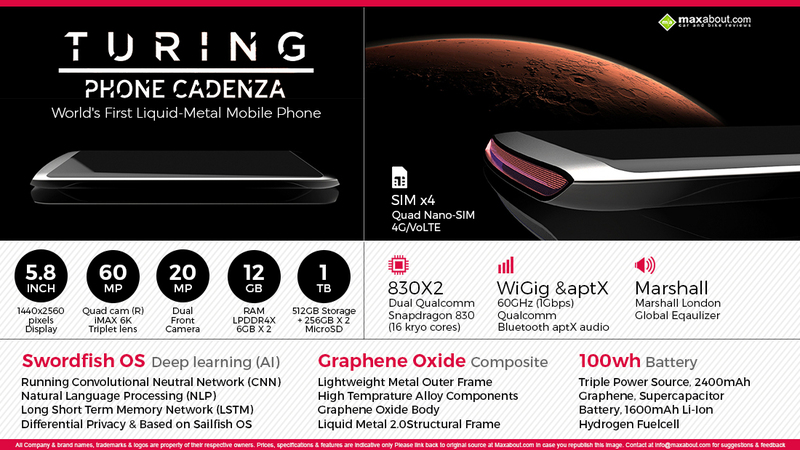 The reports about the upcoming Turing Phone Cadenza has created a buzz in the mobile world. The phone has got a long list of amazing features. Body: The body is made up of liquid metal and the durable Graphene Oxide. Battery: The phone has got surprisingly three power sources- 2400 mAh graphene supercapacitor battery, 1600 mAh lithium ion battery, and a hydrogen fuel cell. SIM: Not two, not three, the phone can support four nano sim cards. And out of these two slots can be used for expanding the storage. Processor: The phone is powered by 2 Qualcomm Snapdragon 830 chipsets which are supported by 2 6GB RAM modules. So, the total RAM of the phone goes as 12 GB. The phone runs on the Swordfish OS and this OS has advanced AI based embedded features which includes a memory network and a neural network. Camera: Coming to the camera specifications, the rear camera and the front camera is 60 megapixels and 20 megapixels respectively. To make your selfies more bright and clear, the phone features two front cameras. memory chips and 500 GB through micro-SD card slots which comes as an additional. VoiceOn technology: The phone will have natural language processing built into it. With the “VoiceOn” technology, you can switch it off and on with voice commands. Another possibility is that voice might be used for bio-metric authentication. Another tech known as “Advanced AI Voice”, is about a voice based intelligent assistant. The phone is definitely beyond just being called as a concept and the company has plans to start its shipping in 2017.